Chrome is a 28 year old woman. She worked as a custom jeweler before her change into a Chrome-colored metal-clad brick. She was slight of build before the change, and grew both in height and width with the change. She is now 5'11" tall, and weighs approximately 1,000 lbs. Even after the change she is barely larger than a normal woman, however. Her hair is black, and her eyes are green. As a brick, she has the common traits of being immensely strong - even moreso than most due to some benefit of the metal running through her body. Her body isn't solid metal, although her skin and bone structure both are. She is stronger than most bricks, capable of lifting approximately 75 tons, although she has not tested this limit. Her armored skin is even stronger than most bricks, taking a mutant's claw (Rael's) additional time to scrape though (H.E.R.O. - Metamorphosis), although he wasn't using his full strength backing a swing at the time. She can hold her breath far longer than a normal person, and regenerates as do all supers. Her healing is sub-par for even a brick, however. She also appears to have a weakness to electricity, as seen in her combat with Hellshock in H.E.R.O. - New Markets. Also, her feet and hands don't have the same grip normal skin has, and she tends to slip on smooth floors. She was captured (and later freed) in H.E.R.O. - New Markets, and due to the mind control and memory wiping later on, she hasn't had much of a chance to react to her change yet. Her greatest exposure ('off screen') was in the hospital after her change where she coped well with the initial change of being a brick. 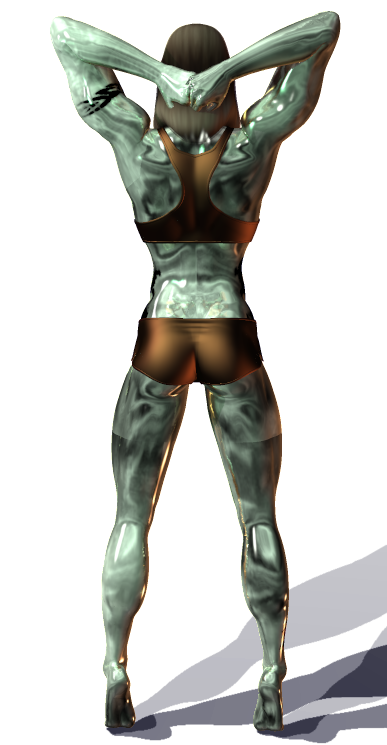 Chrome first appeared in H.E.R.O. - Metamorphosis (brief mention in the hospital scene with Rael).